Mates / SmartMate —» Alt + drag (component). Move with Triad mode and in Exploded Views, allign the triad with an edge or face —» Alt + drag (the center ball or handle on the trial and drop it on an edge or face. Copies the component and creates a SmartMate —» Alt + Ctrl drag. Copies a component —» Ctrl + drag it. Insert a component & rotate 90° —» while insert —» Tab. Temporary displays all hidden components as transparent —» Ctrl + Shift + Tab —» Click a hidden component to change it to show. Invokes mouse gesture —» In a blank area Right-click and drag. Rotates a component relative to the assembly origin —» On a component Right-click and drag. Insert and Reorients a Routing component —» Shift + arrow keys. Copies sketch entities , parts, sub-assemblies, assemblies, drawing views —» Ctrl + C. In Feature Manager design tree, copy the feature as an assembly-level feature. Pastes sketch entities , parts, sub-assemblies, assemblies, drawing views —» Ctrl + V. In Feature Manager design tree, paste the feature as an assembly-level feature. 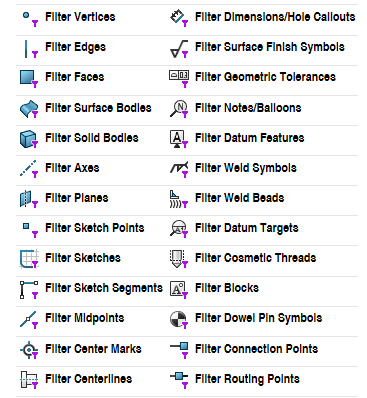 Copies sketch entities, parts, subassemblies, assemblies, drawing views —» Alt + drag. 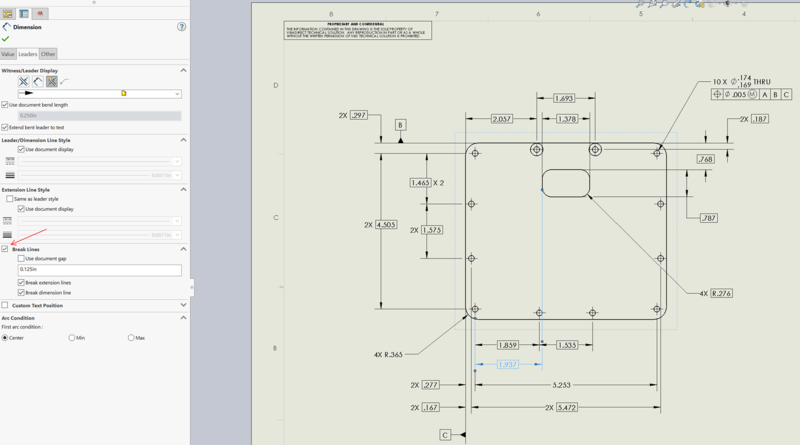 Turn off automatic alignment when placing dimensions and annotation —» Alt + click. Moves an annotation independently from the group in which it is contained —» Alt + drag. Insert a ° symbol —» Alt + 0176. Insert a Ø symbol —» Alt + 0216. Insert a µ symbol —» Alt + 0181. Creates additional leaders on a note —» Ctrl + drag (a leader's arrowhead). 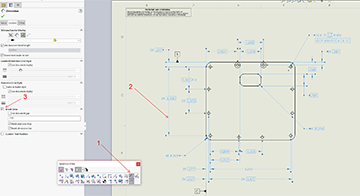 Snaps a dimension to the MAX or MIN location —» Shift + click (when dimensioning arcs & circles with Smat Dimension tool). Change the annotation view plane for a dimension or annotation —» ` key. Rotates the model parallel to the viewing plane —» Alt + arrow keys or —» Alt + drag the middle mouse button. Rotates the model parallel Moves an annotation independently from the group in which it is contained —» Alt + drag. Rotate the model 90° symbol —» Shift + arrow keys. Zooms the model in —» Shift + Z — Zooms the model out Z.
Zooms the model in and out about the screen center —» Shift + drag the middle mouse button. Zooms to fit —» F.
Shows a hidden body or component —» Alt + click (when hoover over the body or component). Shows a section view when using the magnifying glass —» Alt + middle mouse wheel. Opens the View Selector —» Ctrl + spacebar. Opens the View Selector and Orientation dialog box —» Spacebar. Opens the Appearances PropertyManager when you drag and appearance from the Task Pane onto a model —» Alt + drag. Select anywhere in a table to move the table —» Alt + drag or —» Ctrl + drag. Breaks the drawing view alignment when insert a drawing view —» Ctrl + drag. Copies annotation without snapping to the grid or to other annotations —» Ctrl + drag. 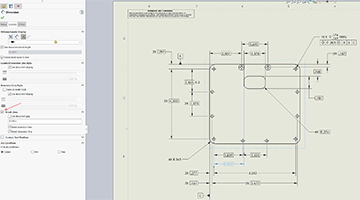 Selects on edge in a drawing view if multiple edges are collinear —» Shift + click. In general, when an edge in a drawing is selected, the entire line is highlighted if all of the line segments are collinear. Moves a dimension to another drawing view —» Shift + drag. When drag and drop it on another view. Pans a model —» Ctrl + arrow keys or —» Ctrl + drag the middle mouse button. Moves a set of sketch entities —» Shift + drag — Move a feature of a part —» Shift + drag. Move the selected drawing view and any related views together as if they are one entity —» Shift + drag. Moves a dimension to a different view —» Shift + drag. 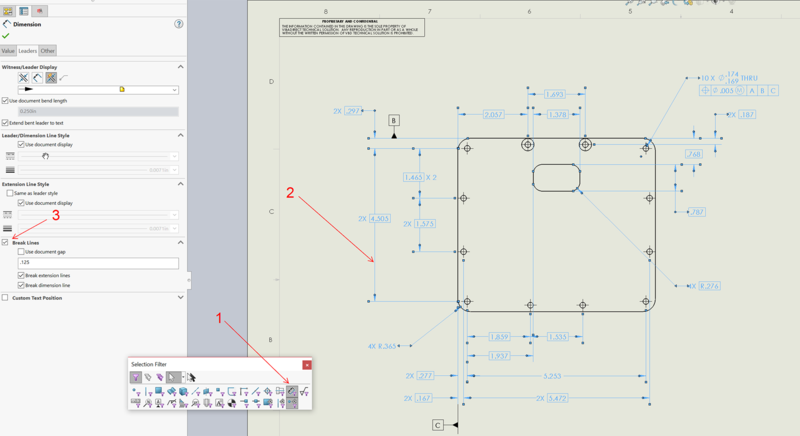 Flips the direction of the forming tool —» Tab when dragging the forming tool onto a face. Symmetrically adjusts both handles of a control point in a spline —» Alt + drag. Suppresses infernce lines when dragging an endpoint —» Ctrl + drag. Turns off automatic sketch relations —» press Ctrl while sketching. Turns on snapping —» Shift + click. Line snaps to specific lengths —» Shift + drag when sketching a line. Changes the XYZ plane —» Tab when sketching in a 3D sketch. Rebuilds the model —» Ctrl + B — Redrawn the screen —» Ctrl + R — Moves among open documents —» Ctrl + B. Open the shortcut bar —» S — Rpeat the last command —» Enter. Use a mouse gesture as a shortcut to execute a command or macro quickly by right-draging in the graphics area to invoke a preassigned tool or macro from a drawing, part, assembly, or sketch. You can enable/disable mouse gesture, and set the number of mouse gestures that appear in the mouse gesture guide. To select different types of entity, use selection filter (F5). Section view in Model: In a part/assembly document —» select Section View —» Section View Property Manager —» Section Method —» select Planar (to define a section view by selecting one, two, or three planes/planar faces) or Zonal (to define a section view by selecting one or more zones. Zones are defined by the selected plane or face and the bounding box of the model) —» Section Option —» select how the section offset is calculated Reference Plane or Selected Plane —» Section 1 (select a plane) —» set the offset distance and rotation (if the selected is Zonal, you can't reverse the section direction) —» Section 2 and 3 is for model with additional planes or faces —» click Selected bodies or Selected components to create a section view —» Selected components (select Exclude selected or Include selected —» select Enable selection plane —» drag the center ball of trial to view hidden components —» if Zonal under Section Method is selected, select one or more intersection zones —» Preview —» Save —» Save As (View Orientation) —» View Name (SectionView) —» Save. Break Dimension Lines: When the dimension lines are broken, they break around lines that are nearby. If a dimension is moved significantly, it may not break around the new nearby dimensions. To update the display, unbreak the dimension lines and then break them again. To break a dimension line —» select the dimension —» Dimension properties —» select Leaders tab —» select Break Lines —» un-checked Use document gap —» specify the gap (ex: .06) —» check Break extension lines —» un-check Break dimension lines —» OK. However, this would take some time to select them all one by one. The easiest way we found is to use your selection filters command. To break all dimension and extension lines —» select Filter Dimensions/Hole Callouts (1) —» window select all dimensions (2) —» in Dimension —» select Break Lines (3) —» un-check document gap —» enter your prefered gap —» OK. Replacing Fasterner Types in Assembly: Design Library —» Bolts and Screws —» select Hex Screw and drag it into the assembly —» select Size + Length —» OK —» Cancel —»select the Inserted Fasterner from the tree —» RMC —» Open Part —» File —» Save —» Save As —» select the folder where the Edit Assembly stored —» Name the Fasterner —» Save —» Close —» In the assembly tree select the fasterner to be replace —» Replace Components —» in Assembly select the fasterner to be replace —» With this one —» Browse —» select a Fasterner to replace —» OK to replace —» Delete the Drag-in Fasterner.